Ravi Sahu has always been fascinated by artificial intelligence (AI) and its potential in industrial applications. By 2016, he had a prototype for a revolutionary computer vision platform that analyzes data gathered by drones. Then, a friend with an extensive experience in demolition and blasting recognized the potential of this technology in the mining and blasting fields. He suggested to Sahu how the prototypes could bring about a ground-breaking path for the modern mining and quarry industry. Further encouraged by a major industry partner, Sahu set out to lay the cornerstone of Strayos in March 2016. 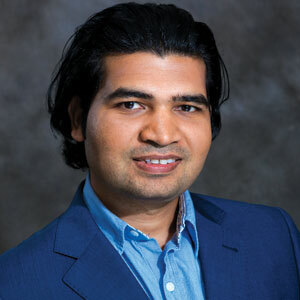 As the CEO of Strayos, Sahu aims to empower stakeholders in the mining industry with precision mining powered by an advanced aerial intelligence platform that leverages drones and machine learning technology. The company offers software solutions required to mitigate the risks and errors occurring during the blasting process in the mining and quarry industry. In addition, Strayos also aims to automate the digitization of mining data by bringing in AI and reduce the time consumed and ongoing costs, thereby streamlining operations and promoting safety in the mining sites. “Most companies in the mining sector are dependent upon hand-held equipment and laser scanners to design blast holes during blasting process,” begins Sahu. A manual survey is conducted to collect important data from the bench, which is simultaneously risky for the individuals involved as well as subject to errors. Moreover, the time consuming manual procedure to collect and analyze data aggravates the situation a notch further. Strayos maneuvers machine learning with automated data integration and analysis, which accurately assesses the bench attributes before a blast, thus allowing tasks to be conducted in unison while reducing the risks associated with them. “Our machine learning technology ensures minimal human intervention in danger-prone areas of the site, thereby reducing accidents while enhancing accuracy,” adds Sahu. Positioned as an innovator in the drill and blasting space, Strayos works closely with the clients to improve their raw material production process by assessing the quality of the raw material generated through data points. Usually, generation of degraded quality material is sold off at low rates ranging from $2-$10, which incurs a huge loss to the company. To ensure production of high-quality raw materials after each blast phase, Strayos optimizes the flow of data regarding the refined materials and connects the data points to the forecasting and demand procedures. While transportation of materials is a significant activity in the mining industry, leaders in this space focus on the haul roads that must be assessed before ensuring proper transport of materials. Almost 30-40 percent of the costs in the mining industry is attributed to the transportation affairs. Strayos effectively automates the entire transportation procedure by the help of drones which leverage machine learning to analyze the grade of haul roads before transporting materials and predicting the best route, keeping trucks and their tires from encountering unnecessary damage. Overall, the incorporation of smart technology by Strayos empowers mining companies to enjoy greater profits while simultaneously reducing commonly occurring disasters. The design created by the blast designer is not always taken into account by the driller, which leads to unwanted disasters. Strayos offers fast and accurate data analysis based on which the blaster and driller work collaboratively using an integrated workflow. The workflow connects with the drill machine, where a 2D map of the blast design is transmitted wirelessly and the drilling takes place following the design. Whenever the driller deviates from the design, real-time alerts signal the driller accordingly. After the execution of the drill, the recorded data of the drilling activity is transferred back to the workflow, for further references. Strayos offers turn-key cloud solutions to its clients, with a brief onboarding procedure. Along with the cloud-based interface, the company is also capable of providing API integration with the client servers and other software systems. This also includes working closely with the client’s IT team to understand the file systems for a smoother accomplishment of tasks. In an instance, a drill and blasting company was immensely benefited by Strayos’ automated technology. The operation sites of the client were mostly situated close to civilian areas and hence the drills had to be of a millimeter level of accuracy to avoid spillages or gas leaks from underground pipelines. Strayos integrated a bore tracking workflow where the geotechnical attributes can be tracked before designing a blast hole. The tracked data was added to Strayos’ software, which could then generate the design. The project helped the client enjoy a 70 percent reduction in costs through adoption of bore tracking equipment and machine learning technology. These methods extenuated the occurring chances of fly rocks due to poor fragmentation and unwanted spillages. The client also expanded their business to 28 quarries from four, simultaneously experiencing more accuracy in drilling and blast activities. Currently, Strayos is developing an application that would assist companies with the production of raw material on a daily basis. “This will optimize other activities in the mining industry, such as integration of data along with the restructuring of haul roads after every blast,” says Sahu. The entrepreneur envisions Strayos to be a comprehensive mining solution for the quarrying and mining industry in the years to come.